You will want to dance in the aisles to the music of Pavlo, a dynamic composer, guitarist, and singer, who has created a unique style best described as “Mediterranean music”. 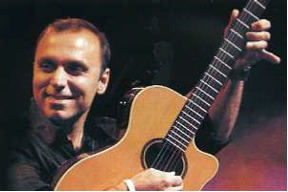 His mix of the sounds of Greek Bouzouki with Flamenco and Latin influences has proven a winning combination, which Pavlo says was the “natural progression” of combining his Classical and Flamenco training with his passion for Greek and European sounds. To promote music appreciation among young people, the association will be presenting additional Pavlo performances for about 1,400 elementary, middle school and home school students at the Glynn Academy Auditorium earlier in the day.